After a decade being focussed on a single type of conflict, the QDR says that the US military must be redesigned to handle the ‘full spectrum of conflict’, a task for which the force is ‘currently out of balance’. The report says that a slimmed-down military will be able to handle a more modest set of military challenges in the future ‘but with increased levels of risk for some missions’. These risks would grow significantly if even deeper levels of cuts are implemented in line with sequestration plans mandated by Congress. If that’s not enough to get America’s friends and allies worried, paragraph two of the QDR’s executive summary will sound alarm bells from Kiev to Kuala Lumpur: ‘… the growing capacity of some regional partners provides an opportunity for countries to play greater and even leading roles in advancing mutual security interests in their respective regions’. It’s time to get a little worried when the world’s most indispensable power starts extolling the tremendous development opportunities available to the rest of us for contributing to global stability. Perhaps inevitably after Iraq and Afghanistan, there’s a slight tone of America turning in on itself in this QDR. The first of three pillars in the paper’s defence strategy is to ‘protect the homeland’. This sits a little uneasily with the second and third pillars: ‘build security globally’ and ‘project power and win decisively’. Of those, the QDR makes it clear that more will be expected of allies in any common effort. The emphasis on winning is less about presence than being able to use decisive strike capabilities. Here there’s a theological shift away from earlier formulations that said the US should be able to prevail in two major conflicts at once. Now the more modest aim is to defeat one regional adversary while ‘denying the objectives of—or imposing unacceptable costs on—a second aggressor in another region’. That said, the QDR offers a number of positive messages which an adroit Australian Defence Organisation could reinforce to bring the relationship even closer. The QDR continues to put priority on rebalancing military capability to the Asia-Pacific and says that the US wants to work with allies ‘to develop forward looking roles and missions to address regional challenges’. The QDR says it needs ‘to deepen [American] engagement in the Indian Ocean to bolster our rebalance to Asia’. This should create an opportunity for Australia to discuss what former Defence Minister Stephen Smith thought would be a second phase of increased cooperation with the US: supporting a US naval rotational presence in the Indian Ocean . There are potentially good opportunities for alliance cooperation around the areas which the QDR says have been protected for deeper US investment: these include cyber and missile defence, nuclear deterrence, space, air and sea capabilities and precision strike. A stronger cyber focus, for example, matches Australia’s priority for growing investment in cyber capabilities. On BMD, there has been bipartisan support in Australia for deepening cooperation, including through opportunities to extend the capabilities of the Air Warfare Destroyers. The last AUSMIN communiqué  announced significantly increased cooperation on space situational awareness. It’s valuable to Australia that the US continues to put a high priority on the F-35 Joint Strike Fighter and as well that Washington plans to grow their special forces—an area where our cooperation in Afghanistan has been particularly successful. In short, Australia is well placed to claim that we can strengthen alliance cooperation in all the areas where the QDR says the US has new and pressing priorities. A refrain throughout the QDR is the premium the US puts on innovation, which is said to be ‘a central line of effort’ and a solution in part to cost cuts. 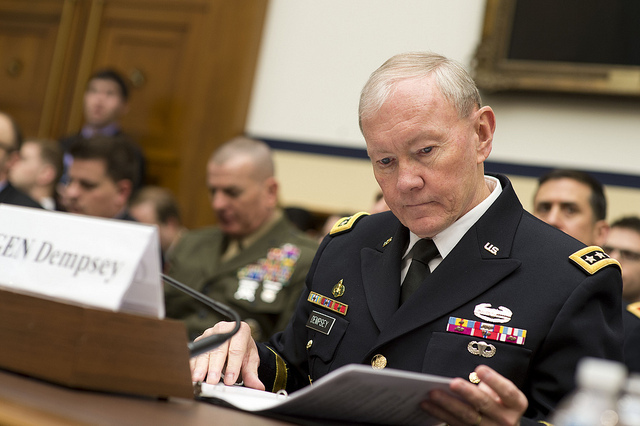 Chairman of the Joint Chiefs of Staff General Martin Dempsey worries in his assessment of the QDR: ‘My greatest concern is that we will not innovate quickly enough or deeply enough to be prepared for the future’. Australia should share that concern, but also use the theme of innovation as a starting point for a new discussion with the US on alliance cooperation. There are good opportunities for both countries if we choose to take them. Peter Jennings is executive director of ASPI. Image courtesy of Flickr user Secretary of Defense .